Last week I introduced the Time Vampire, a deck that attempts to win by taking no turns. If you haven’t read part one yet, go check it out. This week I’ll explain a few more card choices I made and then unleash the full deck list in all of its turn skipping glory. 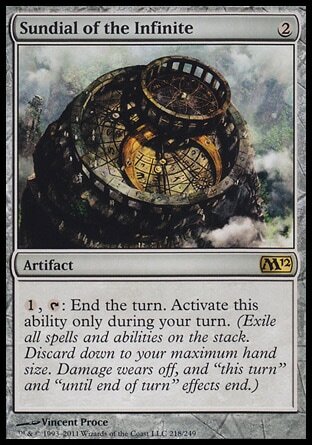 Sundial of the Infinite – I actually missed this card in my first go around, but commandercast reader Mastarwe adeptly pointed out that the sundial is another way to skip a turn. The story checks out, you can activate sundial of the infinite during your upkeep while any nasty upkeep triggers are on the stack. That works very well for us, especially since we still get our untap phase. A fine addition! 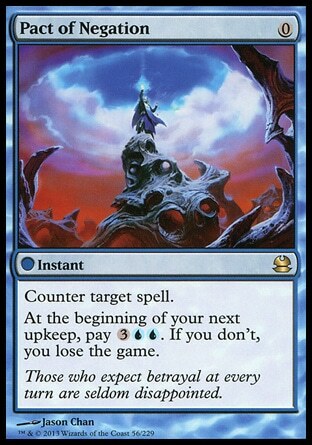 Seedborn Muse / Leyline of Anticipation / Vedalken Orrery – This allows us to take a turn during other player’s turns while still getting the benefit of skipping our own. The Pacts / Hive Mind – For my list I have included the blue, black and white pacts. 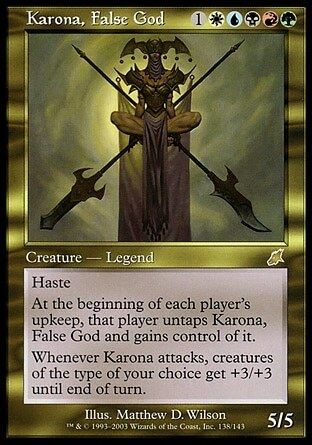 They can help bail you out of a sticky situations and require no mana to cast. Also, if you sundial of the infinte during your ukeep while a pact payment is on the stack, you don’t have to pay it. As always, if you never take another turn, you never pay for them. Hive Mind also gives us a way to cast spells while we are skipping our turns. Sure, they aren’t our own spells, but who’s complaining? We also get the added bonus of an alternate kill condition by casting a pact and having your opponents face down a potential Hive Mind loss by not being able to pay their copied pact bill. 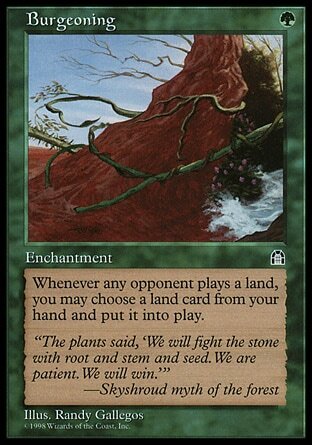 Burgeoning – Now we can play lands even though we don’t have main phases, or any phases for that matter. 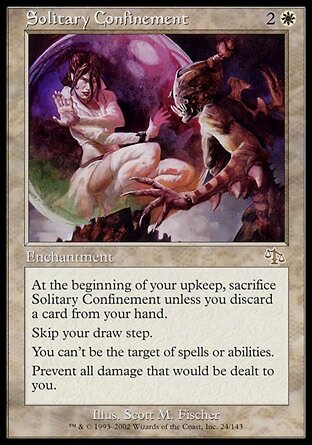 Mystic Remora / Psychic Possession – When you don’t take turns you can scoff at cumulative upkeep costs. 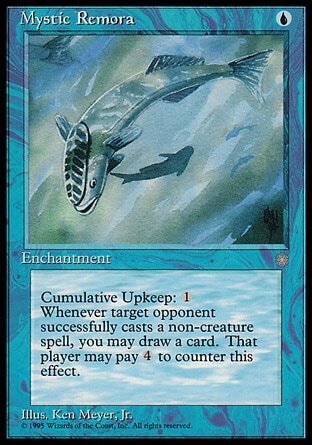 Get your big fancy fish enchantment and draw away because no one is going to want to pay an extra 4 mana every spell they cast. Priviledged Position / Sterling Grove – This deck is very enchantment heavy so we are going to want some methods to try and protect them. We can’t count on being able to interact with the stack, so grove and position are solid choices. 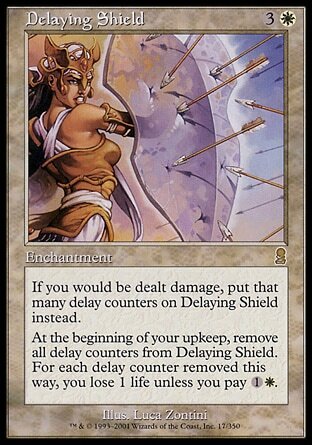 Delaying Shield – If nothing else delaying shield can possibly buy us a turn to let people get drained by our upkeep triggers. However, if we manage to skip a string of turns we never need to remove the counters and lose the life. Solitary Confinement – Skip your draw step? 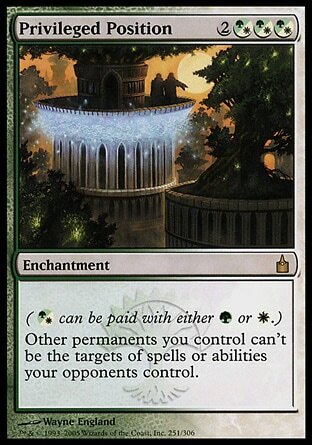 Discard a card during your upkeep? We don’t have a draw step or an upkeep anyways! I’ll take the warden throwing me in solitary any day over being manhandled by the general population. 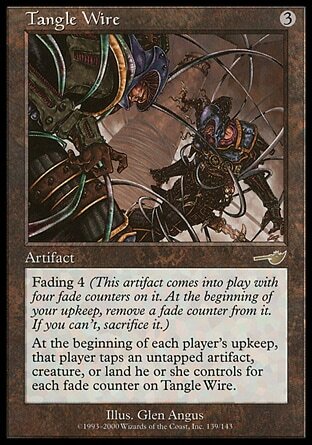 Tangle Wire – Its not as brutal as Stasis, but it can still get the job done of slowing people down. Fading works well with us not taking turns anyways. If you are bold enough to test this deck out or come up with your own version, feel free to contact me. I’d love to hear how much success you had by not taking your turns.